They say when life gives you lemons you should make lemonade. Well, I say when life gives you pears you should poach them in an entire MF'ing bottle of Merlot and then eat the hell out of the whole lot. Maybe not as catchy, but certainly much more enjoyable than some cold drink. Also, making lemonade can be tricky - you've got to find your squeezer, remove the pips, add the right amount of sugar and water...who has time for all that nonsense? Luckily, my recipe for poached pears is quick, easy, and a damned sight more impressive than some glass'o'juice. Trust me on this. The first thing you want to do is get your poaching liquid on the go. There's a bit of this and a bit of that in here, and feel free to tweak yours to your own fancy, but this one worked reeeeeaaal good for me. A cinnamon stick and half a dozen black peppercorns will add spice and a bit of heat, and an apple tea bag is a great way to infuse more flavour into your wine. Right into a deep saucepan you go, along with about 150g granulated sugar and a good squeeze or two of honey, sweetie. Add a couple slivers of lemon zest, then *gulp* dump the contents of a quality bottle of wine in there too. The rich fruitiness of the Concha Y Toro Merlot from Frontera Wines UK is a fine fit here - it's dark, it's delicious and it's going to pound my pears (umm) with bags of berry flavour. 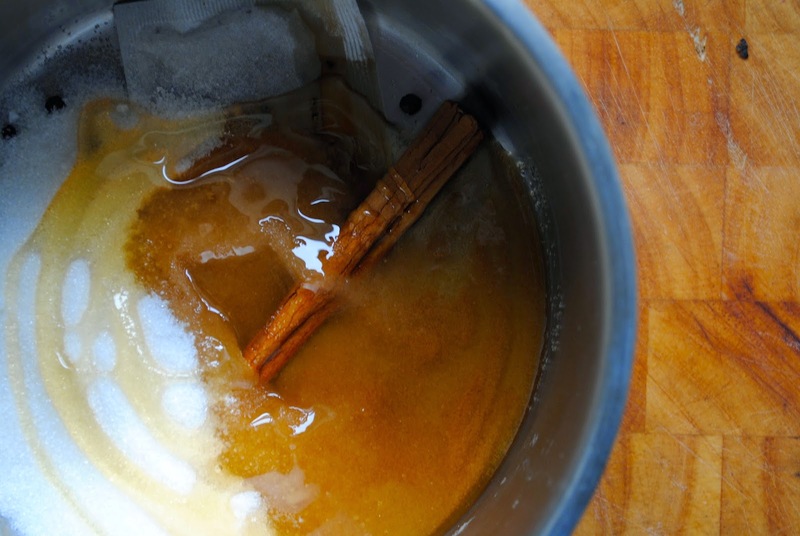 Stick on a high heat until the liquid comes to a boil, then reduce to a simmer. Once your poaching liquid is simmering nicely and all of your sugar has dissolved, throw in a few sprigs of rosemary - stems and all. I absolutely love rosemary, and though it might seem a bit weird to use them in a dessert, a few sprigs just add a beautiful earthiness that cuts through the sweetness of the wine and the pears. Peel your pears, but keep the stems on. Not only does it look nicer, but once they've been poached it makes handling them a lot easier as well, ya get me? Carefully lower them into the poaching liquid, then increase the heat slightly so that it's low-medium and let your pears go for about 25 minutes. You want them to be as submerged as possible, so keep an eye on them and turn if necessary. You know they're finished when a cocktail stick or sharp knife easily slides all the way through the flesh. When the pears have finished poaching, remove them from the liquid and set aside to cool slightly. Then pass your liquid through a sieve to remove all of your stalks, stems and seeds, stick it back on the hob and turn the heat all the way up. Let the liquid boil until it has reduced by about half and is a delicious thick fruit syrup. And that's all you gotta do. Serve the pears warm or cold, with a hefty scoop of creme fraiche and plenty of that ridiculously tasty sauce reduction. Quick, easy, and absurdly tasty. When life gives you lemons, send them back and go out and buy some pears.